This new feature allows to evaluate the thermal result on the cavity where the tool and the relative cooling channels have been defined; through different calculations, the system provides valuable information about the Filling, Holding and Cooling times, showing different report visualizations as Solid fraction (%), Surface temperature, internal Temperature with a section of the cavity. Automatic reporting is produced which can be delivered to the customer. This new feature allows to evaluate the thermal result on the cavity after a draft cooling channels definition. The system guides the user to set the part material, and after a thickness calculation, it provides valuable information about Filling, Holding and Cooling times; then associating the cooling system, the feature shows the thermal analysis result, where the designer can produce different report visualizations as Solid fraction (%), Surface temperature, an internal Temperature with a section of the cavity, to evaluate the result and then start the process of tool definition project. This feature has been improved to provide a better pocket recognition, and to allow the user to create the insert plates, setting the necessary parameters as global parameters, or for a single insert profile. The user can also set the material and the treatment of the insert, just selecting them from the existing list, or by adding a custom material or treatment. The creation of the inserts is also supported by custom profiles. The description of the insert plates can also be customized. This new feature, on a strip study, allows to define a strip with more than two parts, using dynamic fields linked directly to the parts in the graphical area, which allows an easier and immediate parts positioning on the strip. This new option, on the strip study feature, provides the Flange stress value, calculated unfolding a bend with Flange unfolding option, and it sets the relative calculated stress on each single strip step. The user, based on its own experience, can also manually adjust the calculated values, in order to produce a report which can be provided to the customer. This nesting feature has been enhanced by adding the possibility to set the maximum quantity value on each selected part. In this way, it is possible to set a range of parts in your sheet or to fix the number of part to be produced. This feature has been enhanced to provide an improved pockets recognition, including cylindrical holes and 4 axis pockets to automatically create start point to be used for Wire cutting operations. It is also possible to define a second start point on each pocket profile, and to edit and set as default the start point parameters. Enhanced model geometry management to provide greater flexibility for machining purposes by delivering an enhanced user experience which overcomes previous limitations on the 3D geometry management for manufacturing purposes. This enhancement does reduce the time to manufacturing thanks to the simplified user interface. 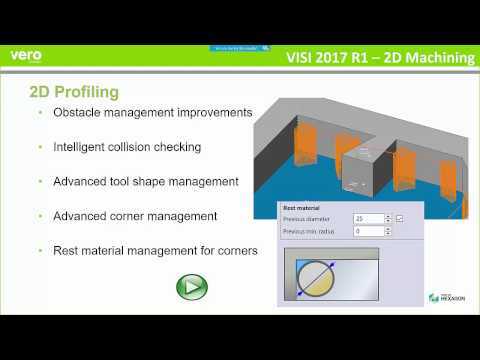 Recording of the VISI 2017 R1 webinar highlighting the major new CAM features and their usage. 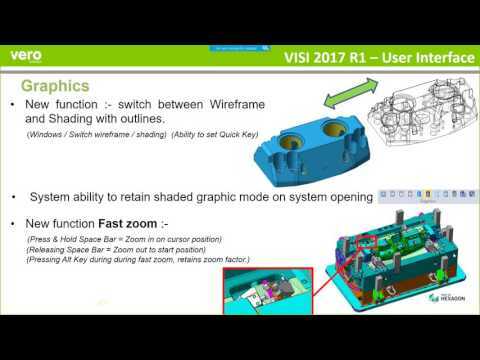 Recording of the VISI 2017 R1 webinar highlighting the major new CAD features and their usage.